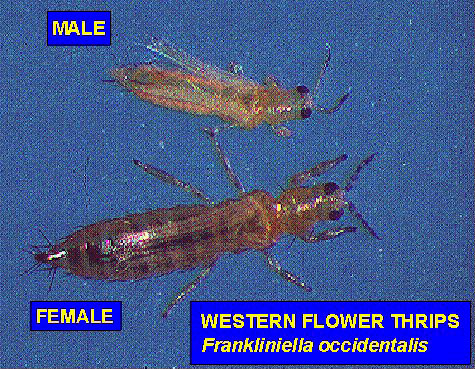 Thrips Frankliniella occidentalis, Thrips tabaciThere are two types of thrips that can be pests to greenhouse operations, the Tobacco or Onion thrips (Thrips tabaci) and the Western Flower Thrips (Frankliniella occidentalis). 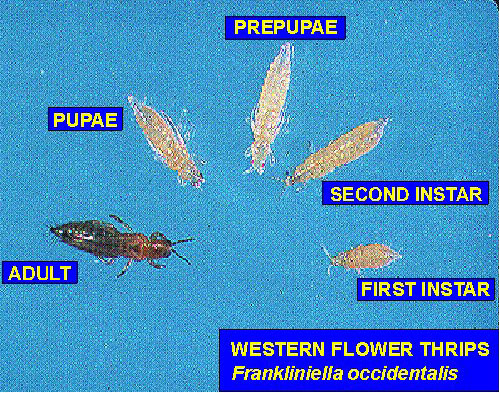 Although Western Flower Thrips have been found to vector Tomato Spotted Wilt Virus and are slightly different in size than the Onion Thrips, the life cycle and feeding habits are similar. Thrips cut a slit in a plant and deposit their eggs into the slit. The eggs hatch into a nymph that feeds on the plant for 7 – 14 days. Thrips are very tiny insects (about 1/50th of an inch), but signs of their feeding are very noticeable. Thrips (nymphs and adults) scrape plant tissue to induce the flow of plant juices. This scraping causes the tissue to desiccate and gradually enlarge to form a ‘window’. They also feed on small fruit, pollen, and flower parts. Full-grown nymphs drop to the growing media (some reports indicate 90% – 95% of the Western Flower Thrips drop to the growing media – the remainder pupate on the plants) and go through a pre-pupae and pupae stage before emerging as an adult and climbing up the plant to feed, mate and repeat their life cycle. Adult thrips are capable of flying. Thrips are capable of pupating and multiplying most rapidly during periods of warm, dry weather. When growing media and greenhouse floors are kept on the dry side, thrips will multiply rapidly. We have not found an individual method that can control thrips. However, a program using a combination of these methods listed appears to maintain populations below destructive levels.